With one million new vehicles 'hitting' Australian streets during 2007, the year has produced a new sales record for the Australian automotive industry. And it has been a busy year for the automotive news media, too. New brands have been introduced or reintroduced. For example, Australians can now choose from various foreign marques such as Caterham, Hummer, Mahindra and Skoda in addition to the multitude of established brands. In 2008 you can expect to see additional new brands introduced or reintroduced to Australia. The Next Car team has been talking cars all year long. During this time we have driven approximately 80 different cars. Our intention was to drive more than 80 units, but with such a busy year, we were stretched to the limits of our capacity. At the end of each year we face the rewarding task of naming just one vehicle as the "Top Drive". As expected, we drove many wonderful cars. Car makers are doing a great job in motivating the market to consume more and more cars. Our task, in assessing the past year, is to determine which single model impressed us most. It's a process of elimination, really. Many vehicles can be 'culled' quite easily, whilst others are so convincingly necessary for inclusion on the 'short list'. With the said short list determined, some very serious consideration and deep conversation takes place. One vehicle was continually praised ..... the Mercedes-Benz ML 350. The M-Class is the best-selling SUV model line-up from a very broad range of Mercedes-Benz vehicles. The M-Class, as it is known, is available in numerous versions. However, we name just one model as the "Top Drive of 2007" and, as such, we have chosen the Mercedes-Benz ML 350 as the top drive. 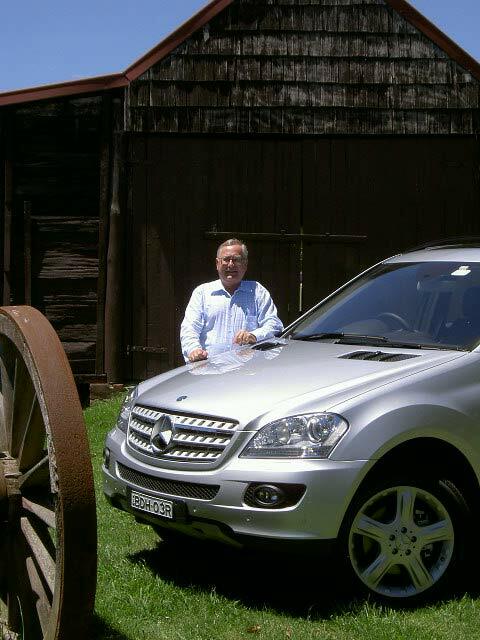 Other versions of the successful M-Class have different qualities, as you would expect, so let me explain the particular attraction of the ML 350. Firstly, though, let's look at the M-Class. This model is manufactured in Alabama, USA. Engines sizes for the Australian market vary from 6-cylinder diesels of 3 litres (2 versions available, ML 280 and ML 320), a V8 petrol (ML 500) and, of course, the high performance 6.2 litre V8 AMG version, known as ML 63 AMG. Prices for the M-Class range from $78,874 to $160,874, without options and the traditional on-road costs. 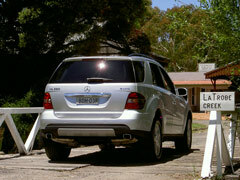 The ML 350 is priced from $88,874 (RRP), without options. 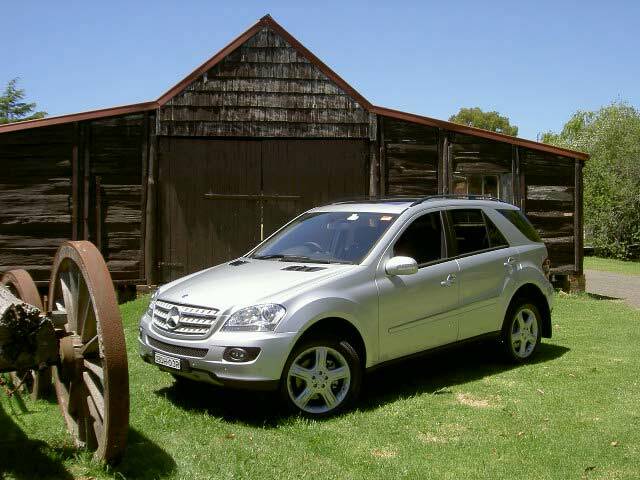 The M-Class was originally introduced to the world market in 1997 although the M-Class is now into its second generation. The ML 350 is our choice amongst the M-Class due to a number of factors. 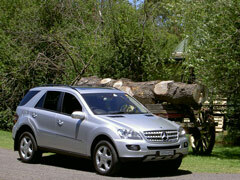 The ML 350 has better performance and is quieter than the ML 280, yet is doesn't consume fuel like the V8 versions. The ML 350 is available with a choice of interiors. There is 'luxury' and 'sport'. We have now experienced both and it is our considered view that the ambience offered by the 'luxury' pack is the better, but that is purely by personal choice. It is difficult to believe that an SUV could be named as the "Top Drive", but in the case of the Mercedes-Benz ML 350 it is completely understandable. 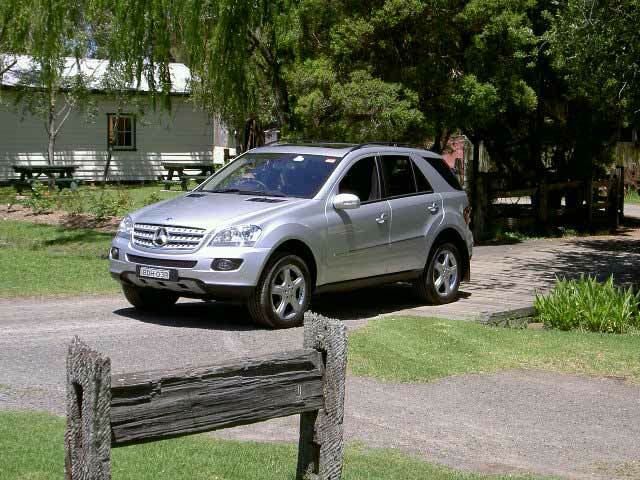 The highly desirable ML 350 is so smooth and quiet that it is an impressive drive. The fact that it is reasonable with its fuel consumption is admirable. Then the comfort level has to be respected, in the best Mercedes-Benz tradition. Passengers enjoy the Mercedes-Benz ML 350. We've proven that on numerous occasions. The equipment level, as expected in a vehicle in this price range, is, shall we say, inclusive. But to be named as our "Top Drive" a vehicle has to be faultless. And that is where the Mercedes-Benz ML 350 really impresses. If we were asked how to improve the brilliant ML 350, we could suggest just one matter. When selecting reverse gear, the external rear view mirrors do not 'dip' to improve the driver's roadside view. The same situation is evident with many vehicles, so Mercedes-Benz aren't alone. However, it is good to experience a vehicle with 'dipping' mirrors and I'll be looking forward (pardon the pun) to them being included in the M-Class at some time. It's a safety issue and, as such, I expect Mercedes-Benz will adopt this 'newish' feature in time. In a year that has seen Audi, BMW, Mazda and Volvo criticised for safety issues, it is pleasing to see Mercedes-Benz continuing to maintain an expanding collection of accolades for the company's uncompromising approach to safety. So the Mercedes-Benz ML 350 impresses the Next Car team as a vehicle that delivers an interior ambience that delights, it performs more than acceptably well yet it is economical for an SUV, it is very well equipped and on the road the ML 350 provides a comfortable rides with no stress or strain. There is no driver involvement to write home about, such as there is in a sports car, but that, in turn, becomes an attraction as the ML 350 lifts motoring to a higher plane of easiness. In the marketplace, the Mercedes-Benz M-Class faces plenty of opponents. There are competitive offerings from Audi, BMW, Land Rover, Lexus, Porsche, Volkswagen and Volvo. Yet we see only the over-achieving VW Touareg TDIs as the only real competitor to the fully satisfying Mercedes-Benz ML 350. 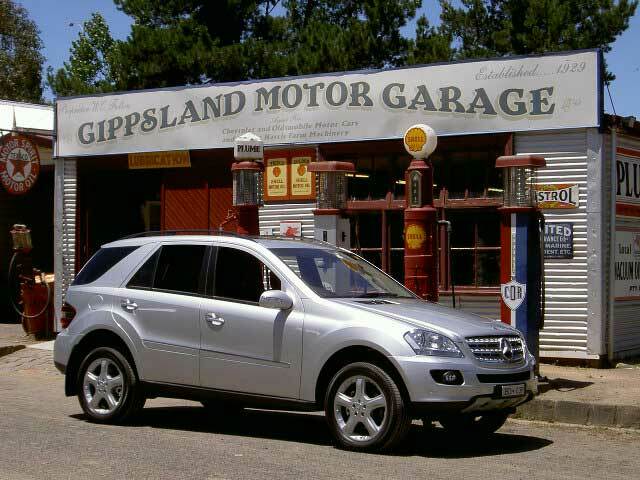 Although quite expensive and out of reach for many car buyers, the Mercedes-Benz ML 350 proves that satisfaction comes in many shapes and sizes. No car could be further away from our previous "Top Drives" (Mitsubishi Lancer Evolution IX and Volkswagen Golf GTI) than the Mercedes-Benz ML 350. Yet driving this car is so pleasant that the experience is one that is excessively enjoyable because of the reasonably low fuel consumption, but mainly because of the comfort level, the standard equipment list, the easy driving dynamics (ride, handling, brakes, steering) and the obvious safety standards which we have all come to expect from the three-pointed star. Mercedes-Benz are to be congratulated for their superb ML 350! It's a car that has and will continue to impress many buyers in the prestige SUV market segment. Other Mercedes-Benz news is: here. The "Top Drive of 2006" is: here. The "Top Drive of 2005" is: here. for their kind hospitality during our photographic session.